Several years ago, my sister in law let me borrow the most amazing cookbook. It's called Irish Traditional Cooking, and I immediately fell in love with it. When I eventually had to give the book back, I ordered my own copy asap. I can honestly say that I have loved every recipe I have made from it! Now, to be fair, there are plenty of recipes that I have not tried (and almost certainly will never try). Things like offal and cockles just don't appeal to me that much. :) My favorite recipes so far, though, have been the breads and desserts. I made this lemon pudding for the first time for St. Patrick's Day in 2008, and I've made it many times since. It's pretty much just delightful in every way. As it bakes, the pudding separates into two layers... a dense, almost caky layer on the top, and a luscious pudding layer on the bottom. 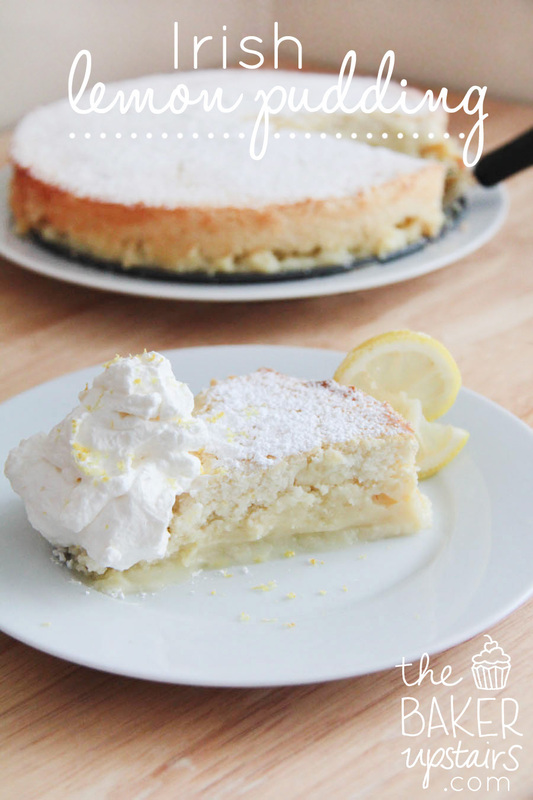 I love the mixture of creamy sweetness and lemony tartness. And adding a touch of fresh whipped cream takes it to an amazing new level. I love that it starts with such basic, straightforward ingredients, and becomes such an elegant, decadent dessert. And best of all, it's really easy to make! Try it, and you'll love it as much as I do! Preheat oven to 350. Cream the butter and sugar well. Add the egg yolks one by one, then add the flour. Add the lemon zest and juice, followed by the milk, and mix well. In a separate bowl, whisk the egg whites until stiff. Fold gently into the lemon mixture until incorporated. Pour into a 8-9 inch pie pan or cake pan. Bake for 40 minutes, or until very lightly browned and set. Sprinkle with powdered sugar and serve warm with freshly whipped cream. Note: I like to double the recipe and bake it in a 9 inch springform pan (with a baking sheet underneath, just in case of any drips). I like thicker layers of pudding, and I think it makes for a prettier presentation. Wow, that looks like pure deliciousness. Pinned to try soon! This looks simple and perfect, I definitely want to give it a try. Yummy, can't wait to try this. Would love for you to come to my link party on Tuesday @ memoriesbythemile.com Hope to see you there. Gorgeous! I must try this one. ñam! Lucky me! I live close enough, and am spoiled enough that Alicia brought over two generous servings of this bad boy with a more than ample supply of rich and fluffy whipped cream. Needless to say, my husband's fork never stood a chance. Out of my way lemon pudding! Loved it. Can you tell me how long you baked it when you doubled the recipe? It sure looks delicious. I don't remember exactly, but I think it only needed about five minutes longer (so 45 minutes total). I usually just judge whether it's done based on how set it is (if it jiggles a lot on top, it's not done) and if it's very lightly browned around the edges. Sometimes I also stick a toothpick into just the top layer (about 1/4 -1/2 inch in) to see if it comes out clean. The top layer is almost like a moist cake, so it should be cooked through before you pull it out. The good thing about this recipe is that a few minutes more or less aren't going to make a huge difference. I would suggest checking at 40 minutes, and then again every five minutes or so until it's done. Is the pudding in the photo the double recipe? Or the single recipe? Is there a link to print the recipe card? I couldn't find one. When I try to print the pages, the recipe card gets split in two, part on the first page and part on the 2nd page. Sorry about that! I just added one. I haven't made it through all my recipes yet to add the printable link, but this one is updated now! That is SO beautiful! LOVE lemon! I know you said serve warm, how is it not warm? I thought about taking it for lunch at church and would probably have to make it the night before. It's actually great both ways! I think it's very best fresh and warm, but I've eaten it at room temperature, or even chilled in the fridge, and it was still awesome! if you double the recipe, like suggested, how long to you bake it for? the same 40 minutes? Thank you for such a delightful recipe! I made it today but was uncertain about exactly how much juice to expect from four lemons. (My lemons were enormous!) the custard was runnier than I thin I it should have been, and the tartness was on the verge of overwhelming. We just sweetened the cream much more than usual... ;) A rough volume estimate for the lemon juice would be helpful next time around! Thanks again! Do you think this will turn out okay if made with Splenda? Does this pudding have a thin crust on top after baking? It looks fantastic. Tried it today (doubled the recipe) and everyone in the family loved it- even those who aren't lemon fans. Super easy! Thanks! I think that mine leaked a little one time that I made it, but not the other times. I have no idea why. I absolutely love the idea of trying it with oranges! I'm definitely going to do that! So you use 4 lemons when you double it? That seems like a lot of lemon for such a small dessert. Yes, I used 4 lemons when I doubled it. It has always come out really well for me and never too strongly flavored or too tart. I guess it would depend a lot on the size of lemons you use… if they are giant Costco-sized lemons then I would suggest only using 2-3 when doubling the recipe. Do you grease the pan? I wonder how this would do in cupcake-type form. would anyone know how long to bake it like that, and would it use cupcake liners? Made this tonight (didn't double) and it was delicious! I was a bit worried that it would be too tart with only 1/4 c. of sugar but it was the perfect amount to balance the tartness/sweetness of the lemons. My seven year old didn't like it but I know my husband will devour the rest when he comes home. I will definitely be making this again! SO easy and SO yummy! Thank you for sharing! WOW just found this cant wait to try it. Did you have to prep the dish before putting in the ingred? Can this be made the day before or is it highly recommended that be made and served same day? I want to make this for a Celtic evening for 120 people. I've found that it's just as good the second day. If making it the day before, it might be advisable to wait to sprinkle it with the powdered sugar, or it will dissolve into the top of the pudding. Good luck! Making it for 120 people is an impressive feat! I'll let you know how it goes. This Celtic event (Mar 24) is one of several events we do throughout the year at our Sr Ctr so I'm used to serving up to 140. I just took the cake out of the oven. It looks beautiful. I doubled the recipe and used the springform pan. However I'm taking it to work tomorrow for Saint Patty's day and I'm wondering if I should open up the sides of the pan before transporting the cake to work. Also, does the bottom of the pan get removed? This is my first time using a springform pan and I'm a bit nervous it won't come out properly. I would just transport it in the springform pan and then remove the sides at work. I always just serve it on the bottom of the springform pan to make things easier. Yes, I always use all purpose flour unless otherwise stated. Do you think I could double the recipe and use a deep-dish pie pan? Yes, I think that would work fine. Thank you! We're having a belated St. Patrick's Day dinner tomorrow night, and we'll try it out then. Just made this for a day-after-st-paddy's-day-dessert. Baked up very nicely! I made a lavender and vanilla whipped cream for garnishing which worked great! It does fall a bit after taking it out of the oven, but so it goes with egg-based desserts. To be expected. Flavor is awesome! Doubled the recipe but forgot to double the milk. Also, I used simple graham cracker crust. Turned out great! Next time won't do graham cracker crust as I think it added too much distraction from the lemon flavor. I made this tonight and doubled the recipe, baked it in an 11" springform and used 3 lemons instead of 4 (because it's what I had on hand). It turned out perfect. I did not prepare the pan in any way. I waited until it cooled before I ran a knife around the edge of the springform, it released just fine. The top cracked a little but it did not fall at all. Enjoyed the flavour and texture (super soft cloud like cake layer and soft pudding layer on the bottom). Also, really liked that it is not very sweet or even really tart... Just right! Thank you, this is going to be a regular in my baking repertoire. Can you estimate how much lemon juice you use? Lemon sizes vary so much! I think it's around 1/3 cup for two lemons, but it really doesn't have to be exact. I've made it with lemons of varying sizes, and it has always come out well. I think it should turn out fine! Halved the recipe because I only wanted to make a few cupcake versions. Used 3 tablespoons of lemon juice which is basically one lemon didn’t add zest as I wanted a smooth texture a touch of vanilla and added a bit more sugar. Tasted amazing topped with a little whipped cream. Advice, fill the cupcakes to the very top because they will sink once they come out of the oven. Has anyone tried this with something besides regular flour to make it gluten free? I made this for the first time yesterday for St. Patrick’s Day dinner with family and used Gluten Free flour from Trader Joe’s. It was great! Light and fluffy. I will use the juice from 4 small lemons instead of just 2 that I had. My son loved it as did I. Thank you Alicia for sharing this recipe. I will make it again. I just tried making a double one, using almond flour. It was a total disaster. Even after an hour and a half, it was still jiggly, and the texture is really grainy, not pudding like at all. I am a professional chef, and have done so many cakes, but this was a definite failure. Probably because you completely changed the recipe by using almond flour. The failure isn't on the part of the recipe, it has turned out perfectly for me. When I followed the recipe. Almond flour made it grainy. Don't blame the recipe because you didn't follow it! I used salted since the recipe doesn't call for salt. If a baking recipe has salt in it then I use unsalted butter. Is there any kind of crust when you double the recipe in the springform pan? I would also like to try this with a graham/chocolate graham cracker crust. I'm not a pro baker, but it seems to me that if you press a crust into the springform pan and pre-bake it, it should work for this recipe, and prevent any leaking as a bonus. If you double this and use a springform pan, could you add a regular/chocolate graham cracker crust? Maybe pre-bake the crust in the pan? I made this last night for St. Patty's Day for the second year in a row. I doubled recipe and used a 9" spring form pan. It did bake @ 5 minutes longer than single recipe. The flavor was absolutely amazing. Everyone loved it. My one regret is that I didn't let it cool in the pan before releasing the sides. It was beautiful, but the pudding spilled out the sides. Luckily I had put it on a big plate! My husband gave it a 10:) I had a piece later that was more room temp and it was just as delicious as warm. Small amount of leaking from pan this time which didn't happen the first time. Really good, simple and elegant!